Woe will beset this country if we draw lines of distinction between class and class, or creed and creed, or along any other line save that which divides good citizenship from bad citizenship." He is the fourth face on Mt. Rushmore, the man who forced America into the modern age just as surely as he led the Rough Riders on a charge up Kettle Hill in Cuba or triumphed in the wild west as a determined cattle rancher. 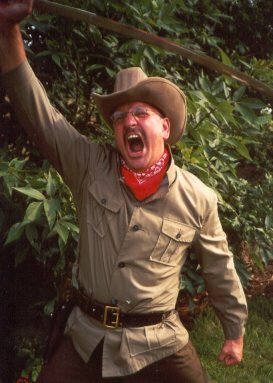 During the summer of 2001 - almost exactly 100 years after Teddy Roosevelt became the nation's 26th and youngest president - Gordon Productions presented a gripping look at his life in the famed production of BULLY, AN ADVENTURE WITH TEDDY ROOSEVELT. Created by Jerome Alden, this one-man performance painted a funny and often-poignant portrait of Roosevelt crafted from stories, letters, speeches and imagined conversations between the president and his friends, family and rivals. Roosevelt molded twentieth century America, building a powerful and benevolent world superpower through policies seeped in integrity, strength and courage. He believed in carrying a "big stick" to enfore peace worldwide. And in America, he fought to create a "square deal" for all citizens, men and women, whites and minorities, people of all ethnic backgrounds and religions. His life and times are modern-day legends. He was a Harvard graduate, a cattle rancher, a New York City police commissioner and governor. As Lieutenant-Colonel of the First U.S. Volunteer Cavalry, called the Rough Riders, he led a daring charge up Kettle Hill in Cuba and became a national hero. Just 42 when he became president - younger than John F. Kennedy and Bill Clinton - he fought powerful corporations to eliminate monopolies. He was the people's president, once threatening to send the Army into the mines during a coal strike to keep families from freezing. He regulated railroad rates and created employer liability laws. In 1905, he was awarded the Nobel Peace Prize for brokering Peace between Russia and Japan. His softer side will forever earn him a place in baby nurseries and toy stores. In 1902, Roosevelt traveled to Mississippi on a bear hunt. The expedition's guide chased a bear cub into the President's line of fire, but Roosevelt refused to shoot and shooed the cub back to its mother. When the country found out, the bear cub became known as "Teddy's Bear," and the popularity of stuffed toy bears spread throughout the world. 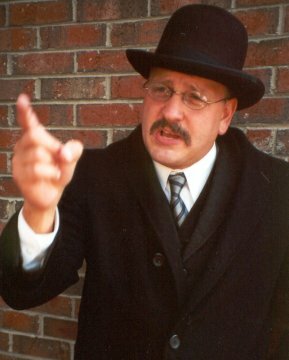 Roosevelt, the family man, the soldier, the outdoorsman, and the president, are vividly portrayed in BULLY by North Carolina actor Keith Cassidy. A veteran of many stage productions, Cassidy has also taught drama for years to college students, children and community-theater actors. BULLY, AN ADVENTURE WITH TEDDY ROOSEVELT was presented by Gordon Productions at Lincoln's New Salem Visitor Center Theater on Friday, August 31 at 8 p.m., Saturday, September 1 at 8 p.m., and Sunday, September 2 at 6 p.m.
Keith Cassidy (Teddy Roosevelt) Keith has been a professional actor, director and theater educator for fifteen years. He holds a Master of Fine Arts degree in Acting Performance from the University of Florida and a Bachelor of Arts from the Wilmington College of Ohio. During his career, Keith has had the fortunate opportunities to play some of the theatre's most challenging roles, including Shylock in THE MERCHANT OF VENICE, Prospero in THE TEMPEST, Stanley in A STREETCAR NAMED DESIRE, Salieri in AMADEUS and both Dr. Treves and the title role in THE ELEPHANT MAN. Other favorite roles include Hamm in Samuel Beckett's ENDGAME, Hornbeck in INHERIT THE WIND, Billy Bibbitt in ONE FLEW OVER THE CUCKOO'S NEST, Otto Frank (Anne's father) in THE DIARY OF ANNE FRANK and Andrew McNair in 1776. For the past seven years, Keith has been the Director of Theatre at Gardner-Webb University in North Carolina, where he transformed a small program with only a theatre minor and four drama classes into a thriving theatre major with a full catalogue of course offerings. Keith is responsible for the entire theatrical season at GWU and directs three shows a year. Some of his favorite directing projects have included LITTLE SHOP OF HORRORS, GREASE, NUNSENSE, OLIVER!, THE MIRACLE WORKER, RUMORS, THE ODD COUPLE (FEMALE VERSION), J.B. and A MIDSUMMER NIGHT'S DREAM. Next April, Keith will direct and play the title role in Shakespeare's RICHARD III. Although most of Keith's work has been on the stage, he has had ample experience in TV and film as well. His impersonation abilities were put to good use in his performances as George C. Scott's General Patton and as Ed O'Neil's character, Al Bundy in a promo for Married with Children. Keith could recently be seen featured in a commercial for Advanced Auto Parts with NASCAR great, Jeff Gordon. He often performs vocally, providing the voices of Jesus, for The Inspiration Channel, Santa Clause, for local merchants at Christmas time, and several animated characters for industrial videos. BULLY marks the first time Keith has attempted to perform a live extended one-person production. The artistic challenges and the research required to play such a fascinating individual has been invigorating. Keith hopes the audience will have as much fun getting to know Teddy Roosevelt as he has. Keith lives in Charlotte, North Carolina with his wife, Debbie, an investigative reporter for The Charlotte Observer, and their two sons, Brett and Zack.